The french artist Jean Michel Atlan was born 1913 in french algeria (at this time a french colony State in northwest Africa). 1930 he moved to paris where he studied philosophy at the University of Paris (known as the Sorbonne) till 1934 and worked as a teacher after. But because of the nazi occupation of France in 1940 he lost his job as a teacher and had to live therefore in poverty in Montparnasse. Then in 1941 he started to work as a self-taught painter and took part of a French and Belgian resistance movement against the Nazi German and Italian occupation forces. Therefore and for being jewish he got arrested in 1942 and interned for 2 years at Hôpital Saint-Anne after feigning mental illness. During the time at the hospital, the philosopher discovered a world beyond of everyday thinking which later inspired him in his work. Then after the liberation of France in 1944 Atlan exhibited for the first time and published his collection of poems, Le Sang Profond. Atlan got a short initial success and recognition by a few avant-garde writers but still lived in financial need. at this time he also worked als pedlar and fortune-tellers. Then in 1946, Atlan present his work for the first time at the side of artist likes Braque and Matisse to the public. He had his breakthrough as an artist in 1956 because of a poster which he designed for the exhibition of the new ‚École de Paris‘ at the Charpentier gallery and an exhibition at the Bing gallery in Paris. Atlan died in 1960 as a consequence of a cancerous condition. The self-taught artist is considered one of the greatest exponent of the „Nouvelle École de Paris”. 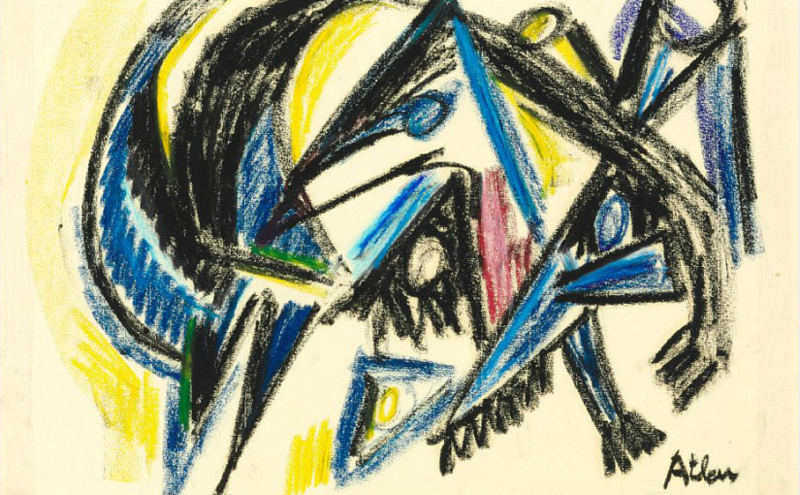 Atlans style was fantastic, abstract-figurative animal forms which were strongly influenced by the the COBRA group and he participates in their exhibitions. Around 1956, he consolidates his style. Strong, black, winding lines enclosing pastel colored areas.